Two run for Kansas Board of Education, District 1 – Welcome to Wyandotte Daily! Candidates for the Kansas Board of Education, District 1, are incumbent Janet Waugh, Democrat, from Kansas City, Kansas, and Michael Powell, Republican, from Leavenworth. They are on the ballot in the Tuesday, Nov. 6, general election. Both candidates appeared at the Oct. 18 candidate forum at Kansas City Kansas Community College. On the topic of what was the most important issue facing education, the candidates had different answers. “The most pressing problem we have right now is our teacher shortage,” Waugh said. There is currently a teacher shortage throughout the state, as well as nationally and locally, she said. There is also a shortage of students entering the education programs to become teachers, she said. The state Board of Education has established a retention and recruitment committee to find teachers, she said. The shortage grew from what was seen at this time last year, she said. Powell said the most important issue facing education is how the students are being prepared to leave the K-12 system, and are they prepared to enter into a career as a constructive citizen. Preparing students for success after high school will require hard work on the part of everyone, according to Powell. He said everyone has to be moving in the same direction, committed to improving education. On the topic of school consolidation or reducing administrative costs, Waugh said district consolidations in the past were the result of districts coming to the state board and asking for consolidation. She said that is the way it should be handled, as a request from the districts. She said she has a problem with a child riding on a bus for an hour or more to get to a school, if school districts consolidate. Last year, the Legislature did a study and found that Kansas schools were some of the most efficient among the states as far as spending money, she said. There already are combined efforts of administration at some districts, she added. Powell said some districts in the western part of the state are looking at whether they can consolidate parts of their administration. What can’t be ignored, he said, is the school may be one of the largest economic engines in that small community, and they might be the community, the hub of everything. 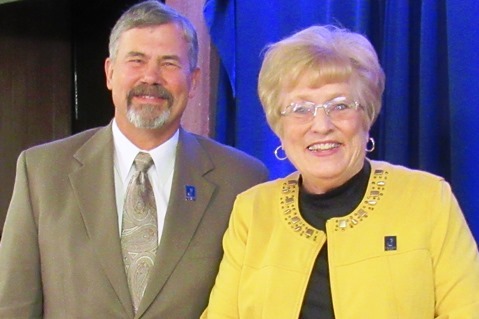 Waugh has served on the Kansas Board of Education for almost 20 years. She was board chair for two terms. She previously served on the Turner School Board for more than 15 years. She is retired from a career in a family-owned car sales business. She said she has been told by business leaders that businesses move to Kansas because of the educational system. She has been working with the Kansas Board of Education to develop the Kansans Can program to provide a new vision for education in the state, she said. The Kansans Can vision has five areas that the state is looking forward to implementing, she said. Powell said the Kansans Can program will not come to fruition until 2026. Only about 70 of about 3,000 schools are engaged in the process, he said. There will be a need to make inroads into issues in the state before then, according to Powell. Powell said the state’s 86 percent graduation rate means there are 5,000 students who are not graduating a year. “Twenty-nine percent of those graduates are measured by the ACT as not fully college-ready,” he said. So, there are challenges, he said. Powell said he believes early education is very important, including pre-kindergarten education. Powell is a retired U.S. Army colonel and has served as an instructor at the General Staff College in Leavenworth. He is listed as a military contractor on his campaign finance report. The candidate forum was sponsored by Business West, other neighborhood business revitalization groups, and KCKCC. To see an online video of the candidate forum for the Kansas Board of Education, District 1, visit https://www.youtube.com/watch?v=dWK5KkV2nVE. More information about the candidates and their positions on the issues can be found at Vote411, offered by the League of Women Voters at https://www.vote411.org/. Also, more information about the candidates’ positions on issues may be found at the Kansas Association of School Boards website at https://kasb.org/sbc0905-4/ and https://kasb.org/nb0921/.